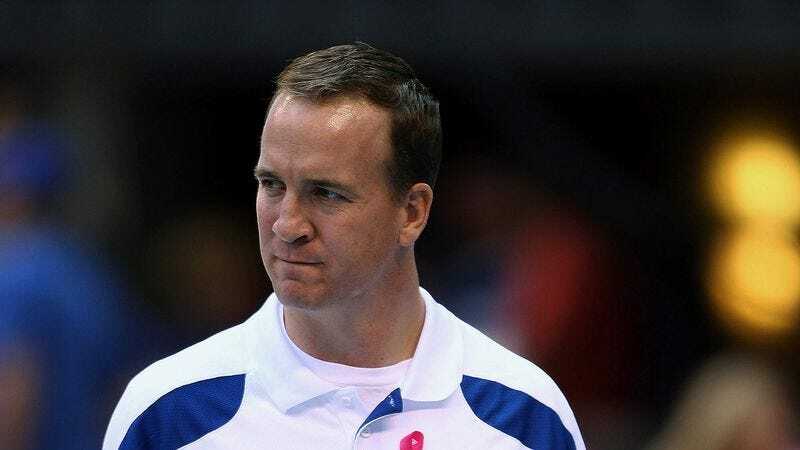 INDIANAPOLIS—Sources confirmed Friday that Indianapolis Colts quarterback Peyton Manning had been cleared by doctors to resume his career of being chased, clubbed, and thrown to the ground by 300-pound men, often with the 300-pound men falling on top of him. "So far as I can tell, Peyton has no reason to be concerned about returning to the most violent game that exists in our culture," Colts neurosurgeon Dr. Hank Feuer said of Manning, who had bones fused together in his spinal column in order to protect the nerves that provide him with basic motor function in all his extremities. "After a thorough medical evaluation, we can safely say that Manning is cleared to engage in an activity that could very feasibly result in his head being pulled backward by one of the world's strongest physical specimens, then subsequently slammed into a cold, unyielding surface." When asked Wednesday whether he had any trepidations about jeopardizing his future with his family for a few games in the twilight of an already Hall of Fame–worthy career, Manning said he was "just trying to focus on returning to football."